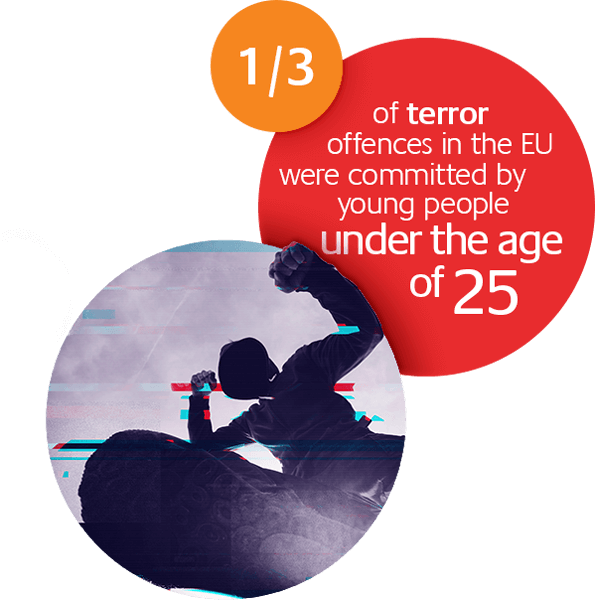 Almost one third of those arrested for terrorist offences in the European Union in 2016 were 25 or younger. Youth aged 15 to 18 make up 20% of all suicide bombers. Youth have an essential role to play against extremism. They can spot early signs of radicalisation and create safe dialogue spaces for their peers to express their frustrations and feelings of marginalisation. Young people are rarely involved in policy-making or programming aimed at countering violent extremism. Extremely Together published the world’s first guide for young people and by young people on countering violent extremism, reaching millions online. The live stream of the guide’s launch alone reached over 400,000 people. You can read the guide at: www.extremelytogether-theguide.org. We help give young people a seat at the decision-making table. Ilwad Elman from Somalia spoke at the opening session of the MiSK-UNDP Youth Forum, alongside Achim Steiner, the head of UNDP. Hajer Sharief from Libya was a keynote speaker at the Ministerial Meeting on Youth, Peace and Security alongside the UN Secretary General, Antonio Guterres. Arizza Nocum from the Philippines was the “respondent” in a panel of former heads of state organized by the Club de Madrid on security and development. Extremely Together received the 2017 Digital Communication Award, which honours industry-leading online public relations and communications projects, campaigns and innovations across Europe. Six Extremely Together Young Leaders received achievement awards in 2017 for their work to counter violent extremism. In addition to reaching out to young people online, we are working with young people in France, Morocco, Nigeria, Somalia, Uganda and the United Kingdom, to develop practical ways of countering violent extremism. The Foundation also seeks different ways to promote youth leadership beyond the Extremely Together initiative. Mr. Annan regularly emphasizes the importance of youth leadership in his speeches and media interviews. In 2017, he awarded the “Advancing Development Goals Contest” prize to the winners of an international competition for graduate students who develop pragmatic solutions to an international development problem.